Hello everyone! It's another new month and with that comes a new Author of the Month. This will consist of a post that includes an interview with the chosen author, along with featuring them in my sidebar for that entire month. New feature I started on my blog in September (Refer HERE if you would like to see the original post & if you would like to be apart of this as an author). Also check out the bottom of the post to enter a giveaway for an Untamed Audio book. This giveaway is INTL. So good luck to all! 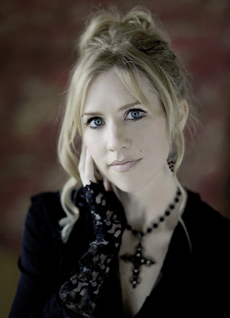 A.G. Howard was inspired to write Splintered -- the first book in her bestselling gothic Alice in Wonderland spinoff, the Splintered Series -- while working at a school library in her Texas hometown. When writing, A.G. is most at home weaving all things melancholy, magical, and macabre into everyday settings and scenes. In her downtime, she enjoys rollerblading, gardening, and visiting 18th century graveyards or abandoned buildings to appease her muse’s darker side. Before sharing with you guys my interview with A.G. Howard, I would like to take a moment to thank Anita for finding time in her VERY busy scehdule to take part in this interview. I have been a fan of her work for years and to interview her meant the absolute world to me. 1. What first inspired you to write? Anita: In my early years, I wasn’t much of a writer. I liked storytelling, though, and often made up tales for the kids I baby-sat as a teen. It was years later, after I’d married, had two children, and lost my grandfather to brain cancer, when I found my calling as a writer. The night he died, I sat down and wrote a two page poem as tribute to him and his life, and it touched all of my cousins so much they asked to put it in the eulogy. When I realized I could actually connect to other people emotionally with my words, I was hooked on writing. So I hold my grandfather up as my inspiration, because the end of his journey was to be the beginning of mine. 2. In one sentence, how would you describe the Splintered series? Anita: SPLINTERED is a spinoff of Alice in Wonderland, in which Alice’s descendent finds out the rabbit hole is real, and has to go in to face the darker side of Wonderland’s whimsy and save her family from the curse of insanity. 3. What are two quotes from the Splintered series that make you proud to say that you wrote them? 4. 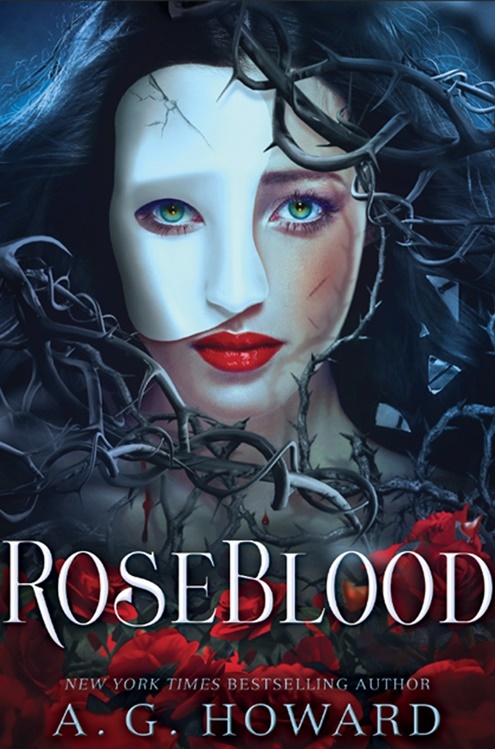 How did RoseBlood come to be and what is one thing you want to share about it with us as fans and readers? Anita: I've always been a Phan in all the story's incarnations: THE PHANTOM OF THE OPERA original novel by Gaston Leroux, the musical, the movie, and even a couple of book adaptations—my favorite being PHANTOM, by Susan Kay, a fascinating and beautifully written prequel to the original book. Since I'd written a successful AiW spinoff, I couldn't stop thinking about the Phantom's spinoff possibilities. To contemporize it, I could set a story in Paris at an Opera House tied in some way to the one in the book—have it renovated into a music conservatory for juniors and seniors. A boarding school where I'd have my heroine sent. Next, I needed to bring in the phantom. Maybe he didn't die at the end of the original book. Maybe he faked his death and somehow lived underground, isolated and undetected for over a century. I had to come up with the *hows* and *whys* of course, but that's the fun of crafting a story. Also, I had to decide what would be powerful enough to lure him to resurface in modern day Paris. There were only two things I could think of: (1) To rescue someone being mistreated as he once was. And (2) Christine. But how to explain her role after over 100 years? These speculations gave birth to my plot. If you read the book, you'll see how I answered all of these questions and wove them into the dark, romantic, and atmospheric tale of RoseBlood. 5. How many years did it take you to get published and what’s a word of advice you would give to aspiring authors? Anita: I've been writing adult fantasy novels since 2005, and have six of those completed now, but none are published yet. It was Splintered, my first young adult novel and book #7 that got me onto the shelves. Which means it took me seven years after I started seriously writing to get there. And my advice for authors on the road to publication is if a writer is serious about getting published, they have to be flexible without compromising. I know that sounds contradictory, but there’s a way to do it: Know the difference between pride and vision. If people are telling you to change something in your book that you love, stand back and ask yourself why you love it. Is it personal to you? Something that other people, including your readers one day, are likely not to connect with? Or is it something integral to the characters or infrastructure to your story. That’s the difference between pride and vision. Pride applies to the glory it brings you. Vision applies to the glory it brings your characters and the book. Never make changes that will compromise your character(s)/ plotline which ultimately IS your book’s vision. But be humble enough to let go of pride if it will make your characters stronger and your book a more solid read. Wonderful blog post, and terrific advice, Anita. Thanks! I enjoyed reading "How did RoseBlood come to be and what is one thing you want to share about it with us as fans and readers?" Sabrina, I am so happy that you were able to interview Anita because I know how much you adore her books! Anyway, I loved reading this ESPECIALLY the phantom part being the phantom of the opera fan I am. Can't wait to read Rose blood! My favorite question and answer was to the first one. It's sad that she had to find her calling after her grandfather's passing. At the same time I am glad she realized how wonderful her writing is. Love the interview! Those quotes are wonderful! I especially love the second one. I enjoyed reading the answer to question five the most because I'm trying to get my book published right now!